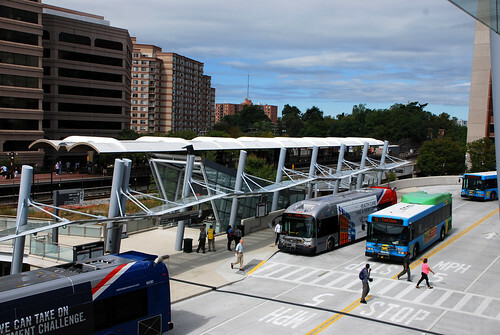 just up the pike: the silver spring transit center is finally open! the silver spring transit center is finally open! 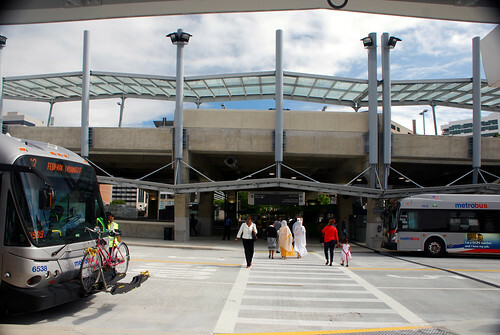 After years of delay and budget overruns, the Silver Spring Transit Center finally opened yesterday. 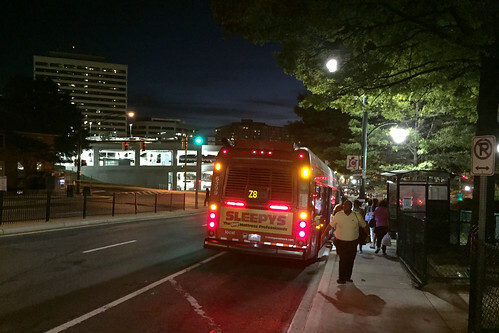 The three-story complex, located next to the Silver Spring Metro station, brings together Metro, MARC commuter rail, local and intercity buses, and a kiss-and-ride. The future Purple Line will also stop there. First proposed in 1996, construction started in 2008. The transit center was supposed to open in 2012 before officials found serious structural defects. A report found that the county, the designers, and the builders were all at fault, and WMATA refused to take over the building. The county brought in a new structural engineer to organize repairs, which began last fall. Right now, Montgomery County and WMATA are suing the builder and designer. But now, the transit center is up and running after a low-key opening Sunday morning. The first bus, a Metrobus 70 headed to Archives, pulled out at 4:08 am. Later in the morning, the Action Committee for Transit announced the winner of its contest to guess the transit center's opening date: Garth Burleyson of Colesville, who'd picked October 26. Goofing off in the transit center before it opens. Photo by the author. Fences surrounding the transit center finally came down Saturday afternoon. When I stopped by Saturday night, curious onlookers were wandering around the empty structure, snapping funny photos and taking in the building for the first time. 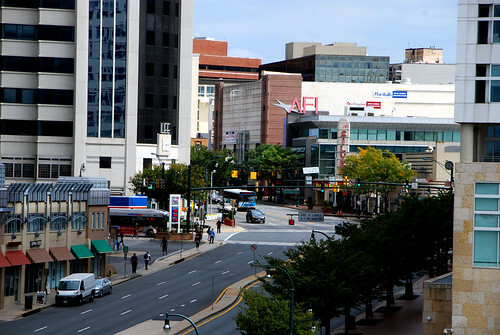 Looking from the transit center into downtown Silver Spring. Photo by BeyondDC on Flickr. The views of the Metro station and downtown Silver Spring are pretty dramatic. The first two floors have stops for Metrobus and Ride On, and intercity buses, while a third floor has a taxi stand, bike parking, and a kiss-and-ride. 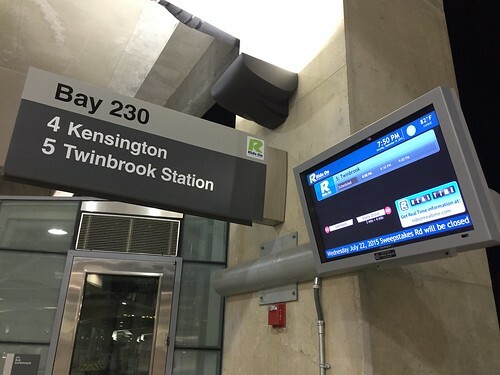 Signs point to where riders can catch each bus, while digital displays give real-time arrival info. Riders catch the Z8 on the street one last time. Photo by the author. 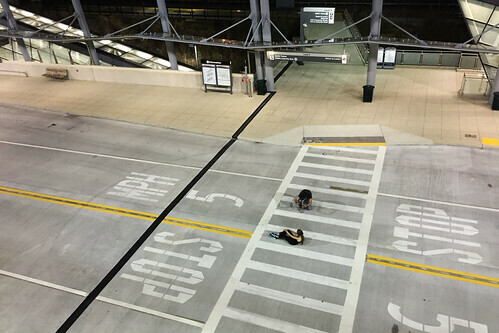 For bus riders, the transit center will require some getting used to. For seven years, buses stopped along nearby streets. Stops for dozens of routes will move into the transit center. Now that the Transit Center is done, one big question is what will happen to the space around it. Plans to build apartments, offices, and hotels next to the complex fell through last year, and the county's suing Foulger Pratt, the developer who sought to build them. This is one of the most valuable development sites not just in Silver Spring, but the region, situated next to one of its biggest transit hubs. With the core of downtown Silver Spring three blocks away, there's a big opportunity to capture all of the people walking there from the Metro. Hopefully, this won't sit empty for long. Check out my photos and Dan Malouff's photos from opening day.